A short history of the longest schoolchildren's strike in UK history, when nearly all pupils at Burston school in Norfolk, England walked out in support of two unfairly sacked teachers who then started their own school with funds from the workers' movement. 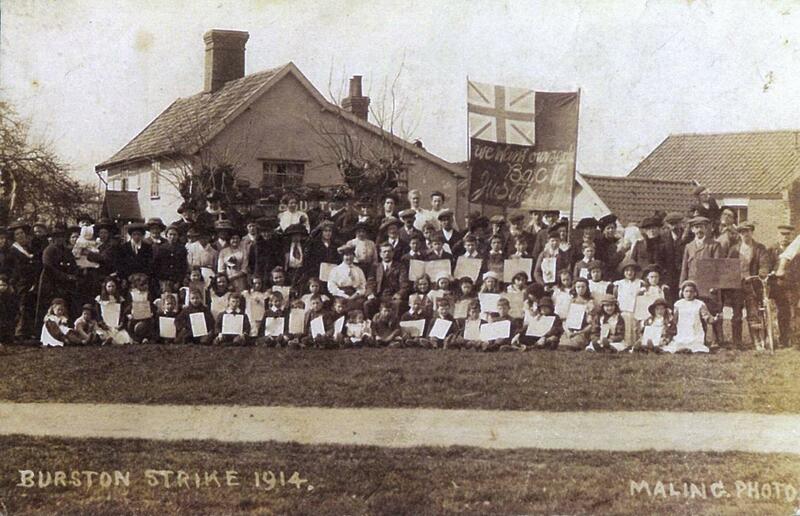 The longest strike in history was not staged by miners but by minors - the children of a small village in Norfolk. On 1 April, 1914, pupils of the Burston village school, supported by their parents, took to the streets in protest at the dismissal of their teachers, Tom and Kitty Higdon. The strike lasted for over 25 years. There really can be no peace or victory for us which does not bring with it freedom for the countryside, liberty and life for the labourer and prosperity and plenty to his home and family. The labourer must henceforth take his place industrially, socially and politically with the best and foremost of the land. He must do this himself - by the force and power of his union. And he can! - Schoolteacher Tom Higdon, quoted in The Labourer, January 1917. In 1902, a Parliamentary Education Bill was introduced offering education to 'working-class children'. 'Education' in this sense meant little more than instructing children as to their place in society, preparing them for service or factory/agricultural work. Though it's often omitted from modern performances, the 1848 children's hymn 'All Things Bright and Beautiful' contained a second verse that spoke directly to the discontent among the working classes: 'The rich man in his castle, the poor man at his gate / He made them, high or lowly, and ordered their estate.' It was this sentiment that was felt to be of greatest benefit to the children. But there were many educated Working- or Middle-class people who saw through the indoctrination and felt that every person, regardless of background, should be treated with equal respect - or rather, that a person's breeding did not automatically guarantee them authority over 'lower' stock. Highly agricultural areas such as Norfolk were seen by the Agricultural Workers Union as ripe for recruitment. Annie Katherine Schollick - known as 'Kitty' - was born in 1864 in Cheshire. Tom Higdon was born in 1869, the son of a Somerset farm labourer. The pair were married in 1896 and eventually moved to Norfolk in 1902, the same year that the Education Act came into force. They were proud of their beliefs as both Christians and Socialists, beliefs that made them idealists who hoped to use education as a means to making a better life for the next generation, rather in conflict with the thinking behind the Education Act as a means of preserving the status quo. The Higdons began teaching at Wood Dalling County School, near Aylsham in Norfolk, on 14 April, 1902, with Kitty appointed as headmistress and Tom as assistant teacher. Almost immediately they found themselves at odds with the establishment, specifically the farm-owning managers of the school. In the view of the Higdons, the school was squalid and unsuitable for children to inhabit. Furthermore, the land owners insisted on pulling children out of school whenever the seasons dictated that they needed cheap labour. Tom Higdon's frustration with one land owner resulted in Tom being fined 40 shillings for assault. As in Wood Dalling, the Burston school's management was overseen by a committee comprising farm owners. The local Rector, the Reverend Charles Tucker Eland who, like the Higdons, was a new arrival to Burston, had recently been appointed chairman of the committee and was keen for the school to continue with the education of children as to The Way Things Are. As Rector, Eland demanded the respect of the people of Burston and saw it as his right to be the central, controlling, figure of the Burston community. It was an attitude that brought him into conflict with the Higdons, who felt that respect was something to be earned, not granted automatically. The luxury afforded to Eland, with his £580-a-year salary and the run of a large rectory contrasted greatly with the living conditions of his congregation, many of whom survived on an annual wage of just £35 and were in constant danger of being thrown out of their homes by greedy land owners. Sadly, the Burston Council school was in a similar state to that of the Wood Dalling building and the Higdon's first task was to make the schoolroom as habitable as possible. Kitty Higdon was surprised to be criticised by the school management for not seeking their permission before lighting a fire in the schoolroom's grate with which to dry the clothes of children who had walked miles through the rain, or to prepare hot water for bathing those children whose hair was infested with lice. As before, the Higdons came up against land owners who insisted on valuing child labour over the children's education, a situation that was helped neither by the Higdons' steady stream of complaints to the management about the unhygienic, cold and damp conditions at the school, nor the common knowledge of their own political sympathies. Yet the Higdons were enormously popular among the parents of the children, most of whom recognised the efforts the Higdons were going to in order to give their children a better start in life. Still, the ruling management disliked the Higdons' refusal to accept their authority and continued to obstruct the couple in matters of school maintenance and attendance. Perhaps understandably, the land owners on the parish council invariably sided with the Reverend Eland in matters of policy, which ensured that all parish issues tended to fall in the interests of the ruling class, and only incidentally to the benefit of the parishioners themselves. After the issues at the previous school, Tom Higdon had abandoned his active role in politics. But having settled in Burston he eventually decided to stand for election to the parish council and encouraged other villagers to do the same. The sight of their 'own' people standing side-by-side with the traditional nominees helped to swing the vote and Tom and his friends were duly elected with a soaring majority - while simultaneously ousting the Reverend Eland and other domineering land owners. Suddenly, the balance of power had shifted. But though they had lost control of the parish council, many of the usurped councillors still occupied positions on the school management committee. Feeling that 'something must be done', and led by the Reverend Eland, the school management targeted Kitty Higdon who, they claimed, had proven discourteous to the management when they had cause to rebuke her for lighting the schoolroom fire without permission. They also obtained testimony from the foster mother of two girls from Barnardo's in which it was alleged that Kitty had beaten the girls as a punishment for lying and had left them in class with soaking wet hair. With an apparently strong case, the management demanded the immediate dismissal of the Higdons from the Burston school. A subsequent inquiry, which came about at the Higdons' request, found no evidence of mistreatment of the children in their care, nor of any contravention of rules regarding the lighting of the schoolroom fire. Only on the accusation of discourtesy to the managers could the Education Committee find any evidence but that, they judged, was sufficient for the Higdons to be removed from the school. Despite requests for help from the National Union of Teachers, the Higdons were given three months' notice to vacate the school. The Higdons reluctantly conceded defeat and prepared to move their equipment out of the school by the end of March, 1914. On 1 April, 1914, as the management welcomed a new teacher to the school, they discovered writing on the classroom blackboard: 'We are going on strike tomorrow', presumably left there the previous evening once the Higdons had departed. Next, they heard some noise coming from outside. A group of children, led by pupil Violet Potter and assisted by the children's parents, were marching down the street and playing instruments. They had created placards that read: 'We want our teachers back' and a banner carrying the single word 'Justice' in protest against the dismissal of their teachers. As they marched through the village, the protestors came across the home of the foster mother who had testified against the Higdons in the inquiry. In her garden stood a proud sign - 'Victory' - which the protestors wasted no time in uprooting and claiming as their own. The group eventually reached Crown Green in the centre of the village where the Higdons gave an emotional impromptu speech of gratitude to the villagers. It was soon decided by the parents - led by George Durbidge, the village fishmonger - that they preferred their children to be taught by the Higdons, whom they trusted and respected, than by a committee-selected stranger. So it was that an impromptu schoolroom was set up on the Green under a makeshift marquee, where 66 of the 72 pupils began to study under the Higdons' tutelage. Kitty Higdon insisted on strict timetabling and attendance as before and ensured as much as possible that her high standards were maintained despite the circumstances. The remaining six children from her old class continued attendance at the Council school. As the months dragged on, it became clear that the schoolroom on the green could not continue when winter drew close. But any hopes on the Council's part that the strike would be cancelled were dashed when room for the children was found in an unused workshop facing the Green. While the school didn't maintain a complete monopoly on the education of the children of Burston, by 1930 at least half of the children were still being sent to the Strike school in preference to the Council-run school and the school also accepted pupils from outside of the community, with children sometimes boarding in Burston itself free of charge. No-one would argue that the Higdons themselves had made the school a thriving success. But conversely, the school could not continue without them. When Tom Higdon died in August, 1939, Kitty was 75 years old and unable to carry on alone. The Strike School closed just a few months after Tom's death and its pupils - the children and grandchildren of the original strikers - were taken to the Council School, where the facilities had been much improved over the years, largely as a response to the example shown by the Higdons. Kitty Higdon died on 24 April, 1946. She was buried next to her husband, in Burston's churchyard. In 1949, the Strike School was granted charity status with a view to turning it into a museum and archive of the village's history. The school is open to this day, all year round. Visitors need only request to borrow the key and promise to return it once they have finished looking around. 1984 saw the village of Burston play host to a rally to commemorate the 70th anniversary of that first protest in 1914. Since then, the rally has become an annual event, held on the first Sunday in September. The trustees now also maintain a website with photographs and articles commemorating the history of the school and of the village's inhabitants over the years. Local newspaper website search for "Burston strike school"
1. libcom note: a film is also currently in production about the strike due for release in 2017.
ha ha what was the strike about? Thank you Steven: the strike was called by me because of '...no particular injustice but of injustice in general...' However, to put it in some sort of context, I had just been ejected/rejected from the State of Israel after being held for 48 hours in the holding cell at Tel Aviv airport. I had spent my last shekel on the one-way ticket (I had planned to gain work on a moshav) and was walking west to my hometown. Oddly, unbeknownst to me, whilst I was getting into all sorts of mischief on my journey (29/9/2000), the intifada had reared its head once again in Palestine. In the end, after being arrested for undisclosable reasons, the 'kind' members of the Berkshire constabulary gave me a rail ticket and sent me packing. I have only given the article you posted a cursory glance but I judge the subject matter of crucial significance and I thank you for bringing it to my attention. If I have anything to add after resding, I will leave my comments here. Now residing in an English country village, I can attest to the classist composition of the local Parish Council. The local school in this village was closed down some ten years ago. The reason cited was as always, 'economic', but I have long suspected that an element of class struggle was at the root of the closure. There certainly has been a strong trend towards gentrification here. All this points to the fact that this article is not an historic artifact but of contemporary relevance. The Burston Strike School trustees now have a new website. One longer term objective is that it becomes an ever growing online educational resource into the Burston School Strike and Rally.